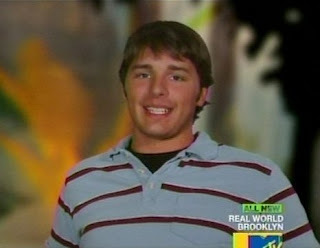 In episode four of Real World Brooklyn Ryan Conklin showed that his views on socializing with females are practical and utilitarian. Ryan is not interested in any extra things, like romance and sentimentality. He just wants to focus on everyone having a good time in the simplest way possible. The episode begins with the news that Scott Herman has gotten the cast invited to a private party. Unfortunately for Ryan, it was expected that everyone should dress nice and Ryan was worried that he didn't have anything suitable to wear. Baya Voce told him he needed to wear a shirt with a collar, which confused Ryan, whose only frame of reference for that manner of dress was going to a golf club. Ryan has the same approach to his wardrobe that he does for girls. His clothes are for casual times and require low maintenance. Ryan settled on wearing his suit. On the way out of the house, raffish Ryan was very impressed with his sensible suit of proletarian brown and gave himself a hearty "bwang! 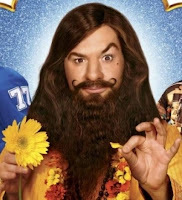 ", which is like a "schwing!" but is specifically from getting excited about seeing yourself in clothes that never need ironing. At the party, Chet saw Scott's model friend Alex, who he had previously met. Chet hoped that he would have the opportunity to get to know her a little more "intimately" that night. Since Chet has stated that he is unwilling to engage in any sort of close or suggestive contact, I'm not sure that he understands what "intimately" means. Later we learn that in the Mormon dialect the term may refer to an act that is something on the way merely to kissing with your eyes open. Ryan gave straight forward advice to Chet, saying, "go get her," and "trust me." 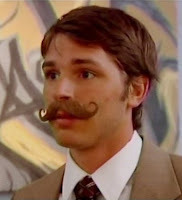 Chet for some reason didn't appear yet to want to take the advice of a man who accessorized with a taped on, ersatz Snidely Whiplash mustache. Chet did manage to chat her up and he danced with her for awhile. He thought from that they he might actually have a chance with her. Yes, with giving a girl the opportunity to be on national television he had a chance with her. Oh, it's going to be sad and lonely to be there when the cameras are turned off for good. Chet did manage to corral a date with Alex and while she and Chet were out together she appeared to enjoy her face time on camera. After the date was over, Chet, somehow flush from his night of heavily bridled passion, talked to Ryan about the evening. Chet talked about his feelings, saying he felt like he had had a really good night. Ryan, on the other hand, wanted to be much more practical in his own assessment of the appointment. Ryan astutely told Chet that Chet really couldn't see himself marrying the girl. Chet agreed. Ryan asked then why was Chet wasting his time dating her. Ryan explained that the reason you go on a date with someone is to "try them out" to see if you want to marry them. In other words, it's a casting process to see if the female is suitable to take care of your house, bear your brood, and most importantly, not try to hinder you from having some fun in your life by you getting out of the house and going out with the guys. My advice to all the Mrs. Conklin-wannabes is that he's just not that into you, but don't take it personal. Ryan Conklin will choose someone for that cameo role someday, but not anytime soon. 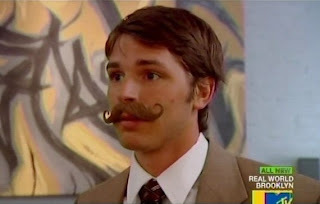 Still, if you don't mind just taking care of business, and be willing to be the subject of a prank or two, you might be the lucky one to curl his 'stache.